"I never thought this would happen in a million years," said Androsoff, 42. 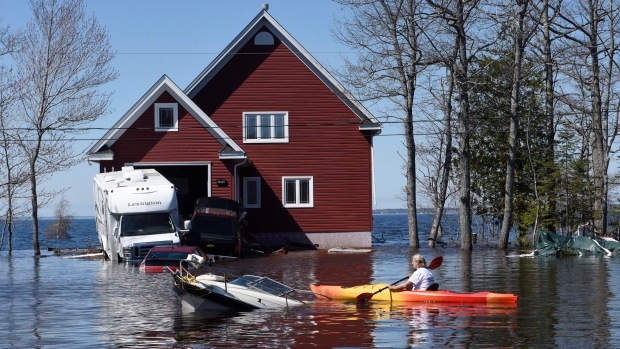 "The most recent flooding in New Brunswick and south-central British Columbia are reminders we can no longer 'cheat the system' on flood risk," Blair Feltmate, who leads a federally appointed panel studying climate adaptation, said in an email. "Cheating has caught up to us." The 45-year-old says if she'd have known the flood risk, she "wouldn't have bought the home." Feltmate says as the waters recede in B.C. and New Brunswick, it's important public attention stays focused on better preparation for the next round of rising waters -- so fewer citizens like Androsoff and Harp are caught off guard. "Every day we don't adapt is a day we don't have," says Feltmate, an environmental scientist and head of the Intact centre of climate change at the University of Waterloo, which completed a 2016 study that showed just six per cent of 2,300 Canadians living in high risk flood zones were aware of the potential devastation they faced. "I'd rather go through a fire than a flood," said Androsoff. "I've been through the 1998 Salmon Arm (forest) fire when we had it and it was nothing compared to this ... With fire you can at least wet things down. Water is way worse. We couldn't do anything." Feltmate says basic basement floods -- either from rivers or isolated downpours such as occurred in Burlington, Ont., in August 2014 -- have become the single largest cost of climate change-related damage in Canada. His research institute has estimated the average basement cleanup costs $43,000. Sean Allen, a mechanic who lives in Maugerville, N.B. 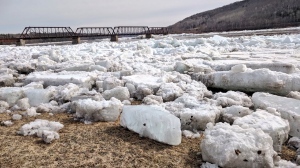 -- a community downstream of Fredericton on the eastern shore of the Saint John River -- already has estimates of over $100,000 for the river water damage to his home, which he'd believed was safe when he first moved in. "It's a kilometre from the shore," he said. Now he's considering moving if he can receive enough disaster relief from the province to pay out his mortgage. Karine Martel, a spokeswoman for Public Safety Canada, says "in many parts of Canada they (maps) are either unavailable or out-of-date due to land-use changes and projected changes in climate." Spokespersons for the B.C. and New Brunswick governments said work is underway to improve the resolution of maps, with New Brunswick saying the higher "modernized and updated" maps are expected by 2020. "There was a lot of discussion about flood plain management that never got to a definitive government program," he said. "It's one thing to have policy, it's another to have a program." 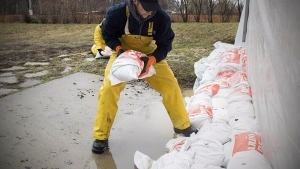 Daniel Henstra, a senior fellow at the centre for international governance innovation at the University of Waterloo, says the flooding in both provinces demonstrates that Canadian homebuyers currently don't have access to "an effective system to make people aware of their property's flood risk." The political scientist argues in a recent study that in addition to accurate, precise risk maps, there's a need in Canada for "clarity on who should be responsible for disclosing flood risk and when." For example, in California, property sellers are required to tell potential buyers if the property is located in the 100-year flood zones. "What we have found is that for every dollar spent by a homeowner to mitigate flood risk, they will on average save $8 to $12 over a decade from basement flooding that doesn't occur if they act on these recommendations," he said. "We have a travel trailer, a home on wheels. Other than that, it's one day at a time," Harp said.